Figure. Western Blot; Sample: Lane1: Human Hela Cells; Lane2: Human HepG2 Cells; Lane3: Mouse RAW264.7 Cells; Lane4: Mouse Spleen Tissue. RPA853Hu02 Recombinant Caspase 8 (CASP8) Positive Control; Immunogen; SDS-PAGE; WB. RPA853Hu03 Recombinant Caspase 8 (CASP8) Positive Control; Immunogen; SDS-PAGE; WB. RPA853Hu01 Recombinant Caspase 8 (CASP8) Positive Control; Immunogen; SDS-PAGE; WB. PAA853Hu02 Polyclonal Antibody to Caspase 8 (CASP8) WB; IHC; ICC; IP. PAA853Hu01 Polyclonal Antibody to Caspase 8 (CASP8) WB; IHC; ICC; IP. PAA853Hu03 Polyclonal Antibody to Caspase 8 (CASP8) WB; IHC; ICC; IP. 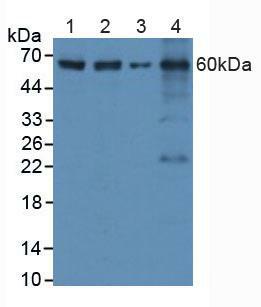 FAA853Hu01 Anti-Caspase 8 (CASP8) Polyclonal Antibody Flow cytometry. LAA853Hu81 FITC-Linked Polyclonal Antibody to Caspase 8 (CASP8) WB; IHC; ICC; IF. LAA853Hu71 Biotin-Linked Polyclonal Antibody to Caspase 8 (CASP8) WB; IHC; ICC. MAA853Hu22 Monoclonal Antibody to Caspase 8 (CASP8) WB; IHC; ICC; IP. SEA853Hu ELISA Kit for Caspase 8 (CASP8) Enzyme-linked immunosorbent assay for Antigen Detection. KSA853Hu01 ELISA Kit DIY Materials for Caspase 8 (CASP8) Main materials for “Do It (ELISA Kit) Yourself".